Long wait for metro rail in Ahmedabad, Gujarat’s business capital, is now bogged into yet another indecision – a group of ministers (GoM) appointed by Gujarat chief minister Narendra Modi is unable to finalize the route in order to put afloat the Rs 22,000 crore project for three months now. Well-placed Gujarat Sachivalaya sources say, the ministers are so busy in such "non-issues" like collecting iron all over India for the Statue of Sardar Patel, planned in the midst of Narmada river, that they have "no time to look into the metro project." In fact, the delay is said to be surprising because, say officials, it has come following a "resolution" on thd dispute regarding the “basic concept” of how to develop metro rail, which was originally planned between Ahmedabad and state capital Gandhinagar. 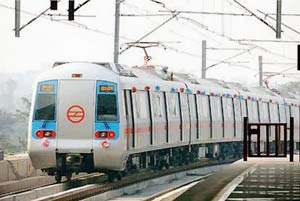 The concept adopted by former executive chairman of the special company formed for the project, Sanjay Gupta, that metro route should be guided by the concept of “transport-driven urban development” has been dropped, even though it was given a nod at the highest level earlier. A former IAS bureaucrat who resigned from the service in early 2000s to float his own business, Gupta, these sources said, was of the view metro need not be taken in areas which are heavily populated and has good traffic. He even made a presentation before Modi why transport-driven development should be a priority around Ahmedabad, one reason why he insisted that the metro should towards Gandhinagar and the Gujarat International Finance Tec-city (GIFT) in the north, on one hand, and towards the proposed Dholera special investment region (SIR), planned as a modern city in the neighbourhood of Ahmedabad, in the south. The GoM, headed by Modi’s right-hand Cabinet minister Anandiben Patel, these officials say, “appears convinced” that metro rail – which would cost on an average Rs 300 crore per kilomtre (Rs 200 crore for elevated metro corridor, and Rs 400 crore for underground correidtor) – alone is a “viable solution” to Ahmedabad’s urban transport problems, which are piling up with every passing day. “It has reached the conclusion that the Bus Rapid Transport System (BRTS), planned to overcome the traffic woes of the city, is on the brink of collapsing, as it was impossible to provide a dedicated corridor to the BRTS, as it exists in Colombia, whose model Gujarat tried to copy why implementing BRTS in Ahmedabad”, an official said. The BRTS has, in fact, intensified the traffic congestion in Ahmedabad, instead of reducing it, as other forms were transport could not be linked to it, despite its horizontal expansion, the official said. “There was no parking corridor provided alongside the BRTS route, which first went to the heavily populated Maninagar area and then was expanded towards the newly developing Bopal, on one hand, and the industrial area off Naroda-Vatva, on the other. There was a complete failure to rearrange local municipal corporation run buses to feed BRTS route. As a result, both BRTS and corporation buses ran on the same route, with passengers preferring the latter, as it is cheaper”. Worse, the official conceded, there is no plan to provide a dedicated corridor to BRTS, as earlier planned, which would require large number of bridges at junctions where the BRTS crosses other forms of traffic. “This is one reason why many have now begun to think that the BRTS is a failure and at some point it should be dropped in favour of the corporation-run Ahmedabad Municipal Transport”, the official said, citing a recent study by a group of experts led by Prof Darshini Mahadevia in Economic and Political Weekly, which says that “although the BRTS is promoted as a low-cost public transport alternative in Ahmedabad, it is not yet accessible to the majority of the urban poor”. Meanwhile, the view has gone strong in Sachialaya that politicians are “more interested” in providing metro to Ahmedabad because of the “big money” involved in it. As against the average cost of Rs 10 crore per km for BRTS, which could at the most double in case the dedicated corridor is actually implemented, the metro project would cost Rs 300 crore per km, it is suggested. “Big money means big cuts and commissions to politicians and bureaucrats, a common factor in India today. This is one reason why a suggestion is being made at the highest level in Gujarat that BRTS is simply unworkable in Gujarat, and metro is the only way out”, a government insider conceded.